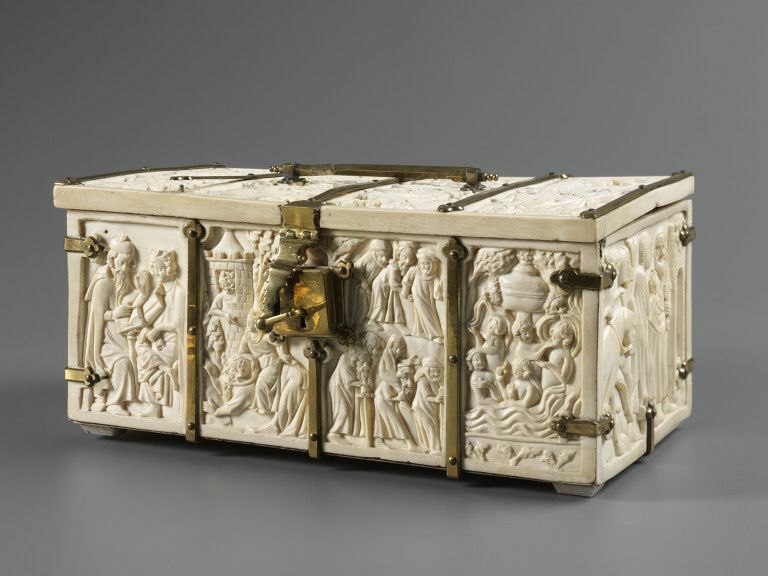 This splendid ivory casket is carved with scenes from romances and allegorical literature representing the courtly ideals of love and heroism. In the center of the lid, knights joust as ladies watch from the balcony; to the left, knights lay siege to the Castle of Love, the subject of an allegorical battle. The remaining scenes on the casket are drawn from well-known stories about Aristotle and Phyllis, Tristan and Iseult, and tales of the gallant, heroic deeds of Gawain, Galahad, and Lancelot. The box may originally have been a courtship gift. This casket belongs to a group (comprised of six complete examples and numerous fragments) of early fourteenth-century French work which depict a variety of scenes drawn from romance, allegory and satire. The group are among the chief examples of the style attributed to Paris, which also includes a casket in the Metropolitan Museum (17.190.173) and another in the Walters Art Museum (71.265). From about 1320 onwards, ivory caskets featuring secular subject matter began to be produced in substantial numbers, often sharing the imagery to be found on mirror backs. Some of the earlier examples are also some of the grandest, and must have been aimed at a wealthy clientele. The nature of the subject matter, which almost always concentrates on courtly love, chivalry and romance, indicates that the caskets were used for the exchange of courtship and wedding gifts. The most important type among the early caskets was what has become known as the ‘composite’ casket, illustrating more than one secular tale. This group of large and impressive caskets, of which at least eight examples survive, illustrate a variety of secular tales and themes. The primary function was not to stimulate memories of the viewers, but to delight and entertain. Ivory casket depicting scenes from romance literature, composed of six ivory panels held together with later brass mounts: on the lid is the attack on the Castle of Love with, to the left, a knight entering the castle by a ladder; on the right ladies hurl roses at the knights below who use siege engines to throw up baskets of flowers; in the centre is the Tourney watched by lovers on a balcony above; the God of Love, standing on the balcony, shoots arrows at the besiegers on the left. On the front are Aristotle and Alexander and Phyllis riding Aristotle watched by Alexander, aged figures approaching the Fountain of Youth and the Fountain with its rejuvenated bathers. On the right-hand end, Galahad receiving from the ancient guardian the keys of the castle in which are the captive maidens. On the back, Gawain and the lion; Lancelot crossing the bridge of swords; Gawain on th magic bed and the ladies delivered from the enchanted castle. On left-hand end Tristram and Iseult, watched by king Mark, and the unicorn killed by the hunter while taking refuge with the maiden. In the collection of Prince Petr Soltykoff, Paris, until 1861; bought by Croyet, London, at the Soltykoff sale (Soltykoff 1861, lot 341); in the possession of John Webb, London, by 1862 (London 1862, cat. no. 128); purchased from Webb in 1866 for £296. 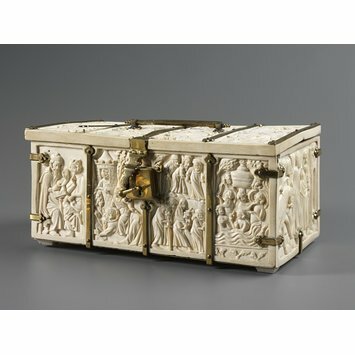 Historical significance: This coffret illustrated with scenes from Arthurian and other courtly literature of the Middle Ages is one of the most imposing examples to survive. The lid follows a convention of division into four sections and depicts a tournament and the Attack on the Castle of Love. The idea of the defence of feminine chastity resembling that of a tower or castle was a popular medieval similie, with the subject also appearing on mirror cases. No literary source has been established for this scene although the Roman de la Rose has been suggested. Ross points out that in the Roman de la Rose, it is not the not the Castle of Love which is under siege and that there is no resemblance between the iconography of the Roman de la Rose in manuscripts and that of ivory carving. On the front of the casket are Aristotle, Alexander and Phyllis who participate in a favourite cautionary tale of the the middle ages. Aristotle warns Alexander that he is neglecting his royal duties in favour of the company of Phyllis, who in revenge seduces Aristotle and rides him, like a horse around an orhard so that Alexander will see. These scenes have sources in the literature of the period, the thirteenth century French "Lai d'Aristote" and the contemporary middle high German version "Aristoteles und Phyllis". The fountain of Youth was another popular subject for medieval iconographers and occurs in manuscripts, tapestries and goldsmith's work as well as on ivory carvings. It has clear literary sources, being mentioned in several works of medieval vernacular literature. Old people enter the fountain from the left and emerge rejuvenated. Lancelot on the bridge of the sword: The scene represents Lancelot going to the rescue of Guinevere who has been carried off by Meleagant to the mysterious knigdom of Gorre, whose entrance is by way of a bridge consisting of a sword blade. Ross suggests that this is based on an old Celtic legend of the other world. The inclusion of this scene, which interrupts the sequential development of another Gawain story - that of the Perilous Bed depicted in the three other sections - gives an indication that the sculptors were following a covention rather than working from knowledge of the story. Gawain and the perilous bed, as told bt Chretien deTroyes in his Perceval runs as follows. The knight arrives at a deserted castle and finds a wonderful bed, all of gold. he lies down, fortunately without removing his armour, for no sooner has he done so than bells attached to the bed ring, shutters fly open and a hail of bolts and arrows descend on Gawain.A lion is then set upon him and Gawain severes its paw. Finally Gawain is congratulated by the lady of the castle, who sends her maidens to honour him. Apart from on caskets, this story occurs on a mirror case in the Museo Civico, Bologna and a writing tablet now in the Museum Niort. One end of the casket features Tristram and Iseult watched by King Mark and the Unicorn killed while taking refuge with a maiden. The other end shows Galahad receiving the keys to the Castle of the Captive Maidens. Barnet, Peter (et al)Images in Ivory: Precious Objects of the Gothic Age (Exhibition Catalogue, Detroit and Baltimore. Princeton, 1997), cat. no. 64, pp. 245-48 (comparable casket in Walters Art Gallery).